Glinsk N.S. has been awarded the Digital Schools of Distinction Award. An awards ceremony to celebrate this great achievement was held on Wednesday 24th June 2015 at Glinsk N.S. A large crowd from the wider school community joined pupils, staff, parents, grandparents, parents association and Board of Management in celebrating this award. Special guests Mr. Michael Meehan All-Ireland Club winner with Caltra G.A.A. 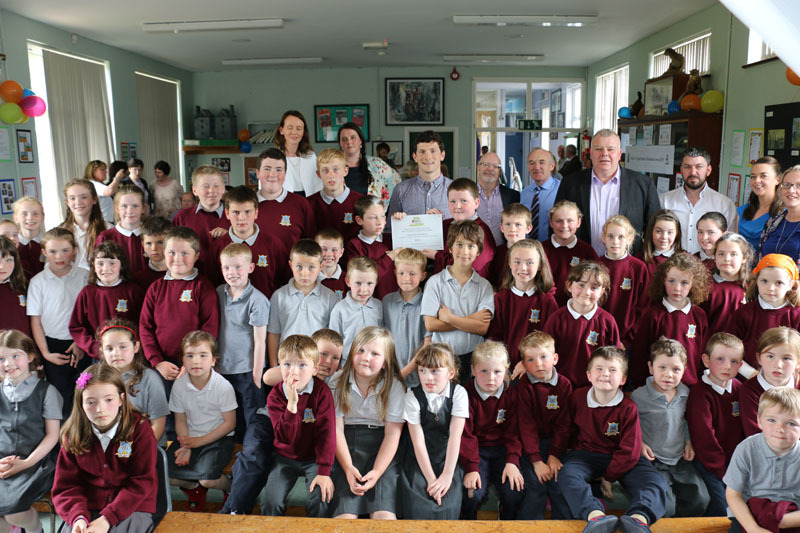 club and Mr. Neil O’Sullivan of the Digital Schools Team based in Dublin West Education Centre attended the award ceremony. The schools Digital Schools of Distinction banner bearing the Digital Schools logo greeted all guests as they arrived at the school. 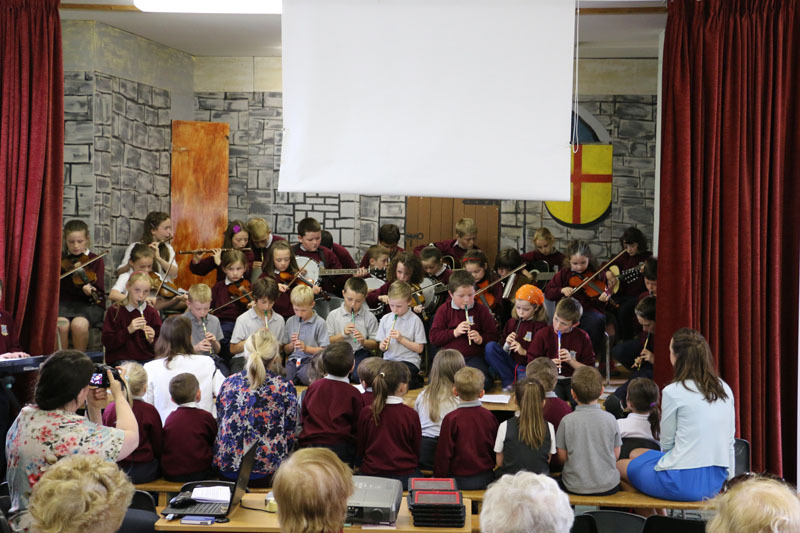 There was a great air of anticipation and excitement in the school hall as the award ceremony got under way beginning with a musical recital where the pupils played flutes, guitars, fiddles, banjos, mandolin, accordions and tin-whistles. 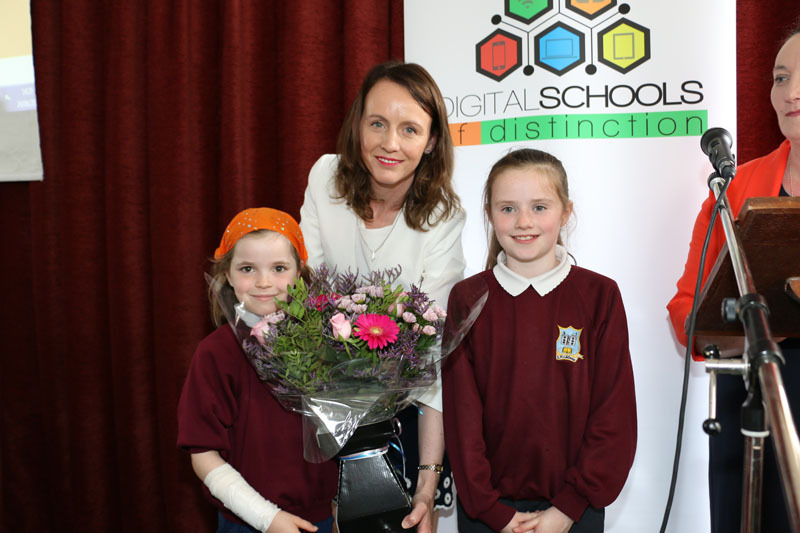 Digital Schools of Distinction is a flagship programme which aims to promote, recognise and encourage excellence in the use of technology in primary schools. This is a nationally recognised award and is accredited by the Department of Education. There are over 3,000 primary schools in Ireland and currently approximately 220 schools have achieved Digital School of Distinction status. Microsoft Ireland and HP are sponsors of this award. Glinsk N.S. will receive a wireless printer and substantial print materials as part of the overall award. Dublin West Education Centre and CESI (Community Education Society of Ireland), PDST Technology in Education, IPPN and the I.N.T.O are among the partners supporting the Digital Schools programme. 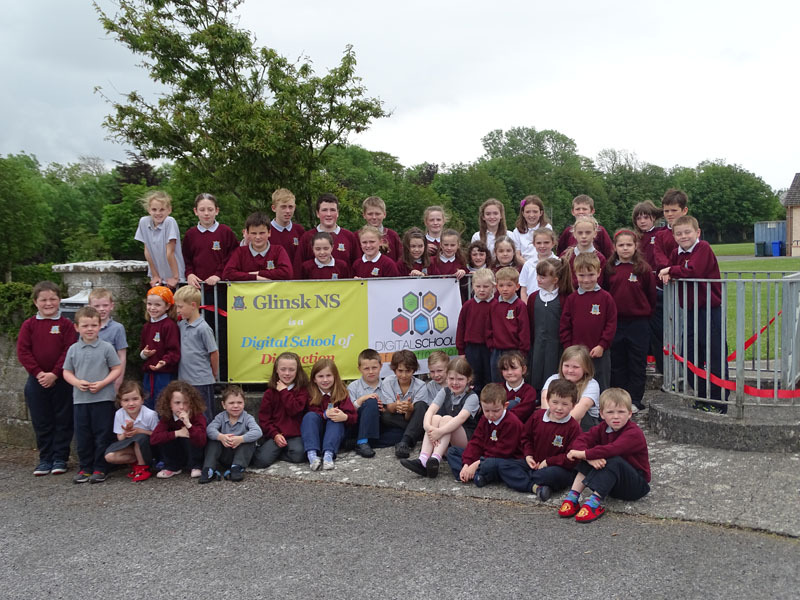 Glinsk N.S. has interactive whiteboards in all the classrooms and a set of i-pads used across all curricular areas. We live in a technological era which is fully embraced as it broadens the learning opportunities and experiences for the pupils. The school website has a blog and pupils blog short accounts on a regular basis about school events, activities and achievements. There is a Twitter feed on the website at www.glinskns.ie with some recent tweets featuring the schools success on the playing fields last week. The girls soccer team won the A final of the Roscommon & Districts FAI soccer league and the boys taking the B final title. Pupils showcased their ICT skills & work at the Digital Schools Award day across all curricular areas. Senior pupils presented work completed by different classes using Photostory, Powerpoint, Microsoft Excel, digital art and iMovies on the iPads. The audience were invited to join in a live online Kahoot Quiz created especially for the day. Pupils assisted the audience in logging into the quiz and encouraged participation in this most enjoyable online quiz tool. Audience participation became very competitive as scores after each round of the quiz were displayed! The focus of the Digital Schools Programme is to support the work of teachers integrating technology into teaching and learning, encourage a sharing of ideas and collaborating with other schools on an ICT project. Mr. Neil O’Sullivan addressed the audience and highly praised the pupils and teachers for their work in integrating ICT into teaching and learning. He outlined the criteria which the school needed to meet to become a Digital School of Distinction. 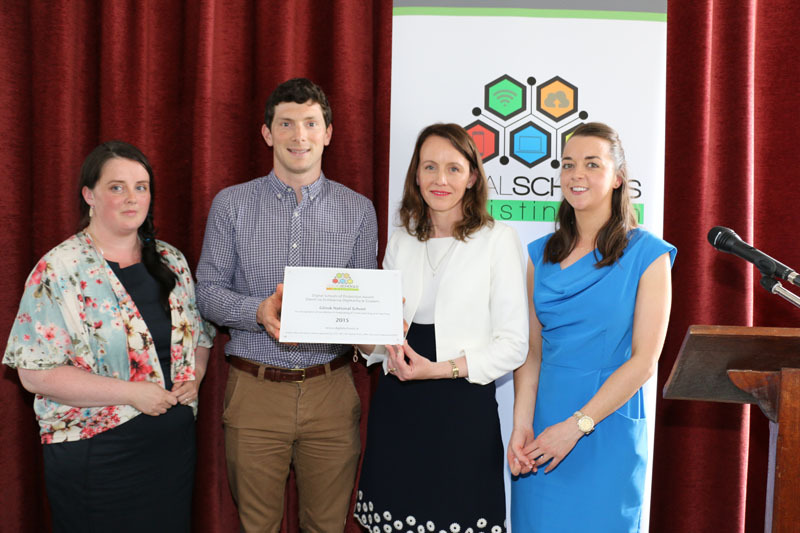 Mr. Michael Meehan – All-Ireland Club winner with Caltra congratulated all on the excellent standard of work by the pupils and presented the plaque on the day to the school staff – Ms Gráinne Nolan (Principal), Ms. Ciara Roughneen & Ms. Julie Keegan. Michael Fitzmaurice T.D. spoke on behalf of the B.O.M and acknowledged the benefits of ICT in teaching and learning. 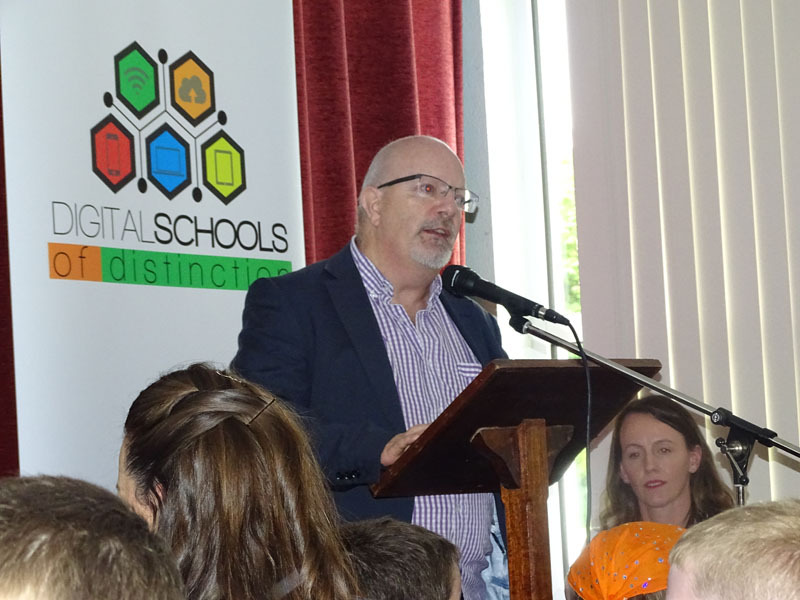 He praised the work of the pupils and teachers in achieving the Digital School of Distinction award and how opportunities like these are a great occasion for the school community to celebrate. Becoming a Digital School of Distinction is a tremendous honour for our school and deserved recognition of the use of technology in our classrooms. It impacts positively on pupils learning experiences and is highly motivational and we look forward to continuing to embrace technology in our classrooms. 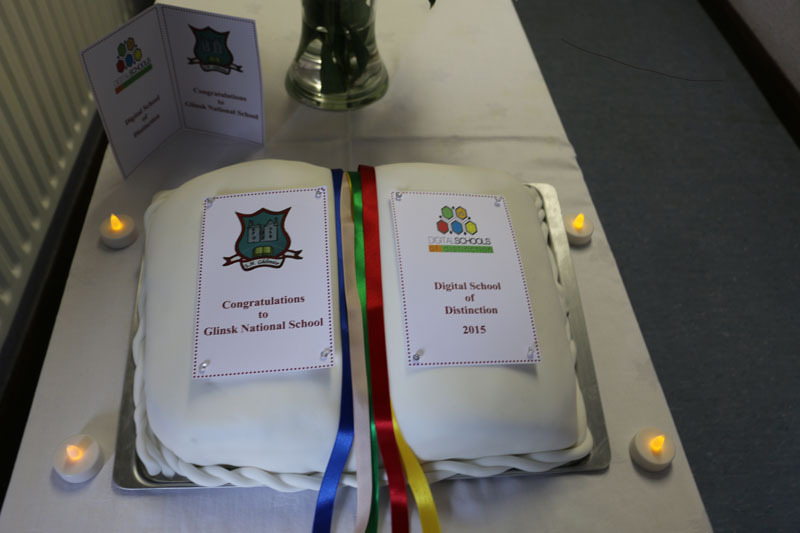 The Staff at Glinsk NS would sincerely like to thank the parents and pupils for their very kind gifts on this day, for helping to organise the celebrations and for their hard work in providing refreshments for all our guests. We would also like to thank, in particular Maria Fitzmaurice, who made the delicious cake. 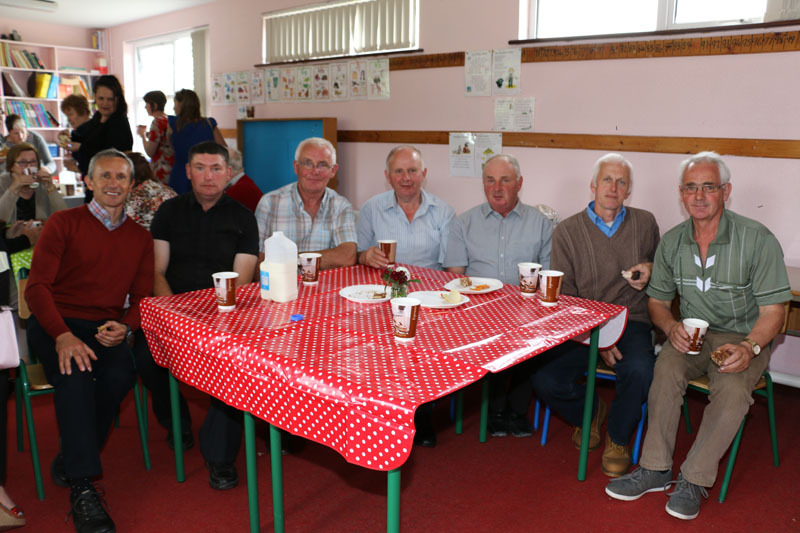 We would also like to express our thanks to Michael Stapleton and the men of the RSS who spent many hours tiding, weeding, cleaning and painting in the days previous to this big event.